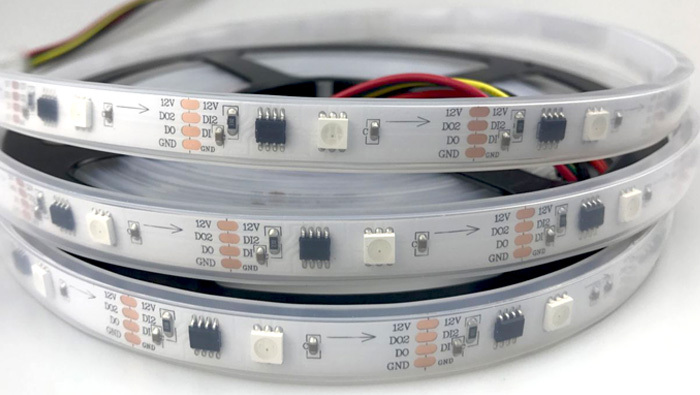 for most led device are just dc12v,so the new dc12v GS8208 individual pixel led strip can easily use in these equipment devices or led projects. Also for the same wattage strips, the current of dc12v strip will be much lower than the dc5v led strips,so it is not so higher temperature and more safety. The GS8208 is a type of featured IC for our dc12v individual pixel led products,it is not only dc12v but also feature-rich with dual-signal break-point function (one bad led,the signal still transfer),built-in program effects,it can work without controller when power on it, but also can run as your own DIY programs with your controller system.